If you’re someone who is into comic books or comic book movies, you know that there are hundreds if not thousands of characters from Marvel. There is a character for just about every type of hero you can imagine and that includes things that crawl, slither, scamper, and creep. I’m talking about insights that are based on common pests such as ants, snakes, spiders, rodents, and more. The most famous of these types of characters is by far Spider-Man, but there are in fact 144 characters that draw their inspiration from pests. How do we know this? 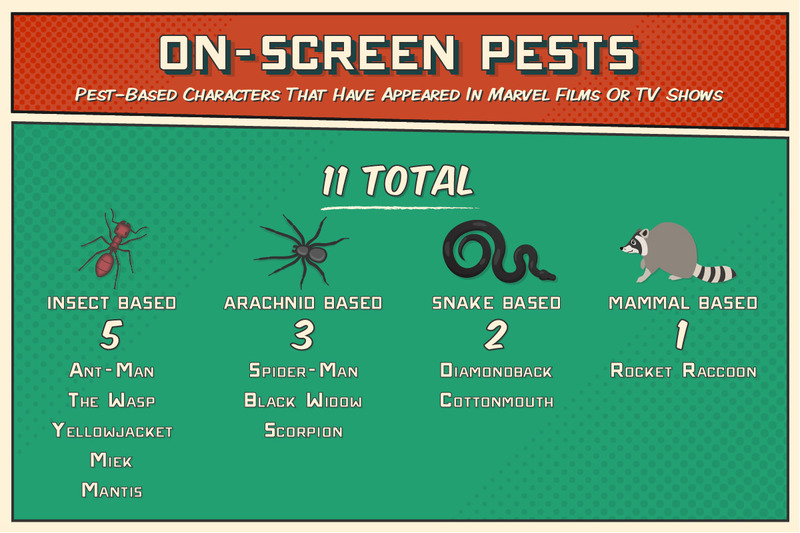 The team at Insight Pest Solutions analyzed every character in Marvel Comics and identified all 144 of them. 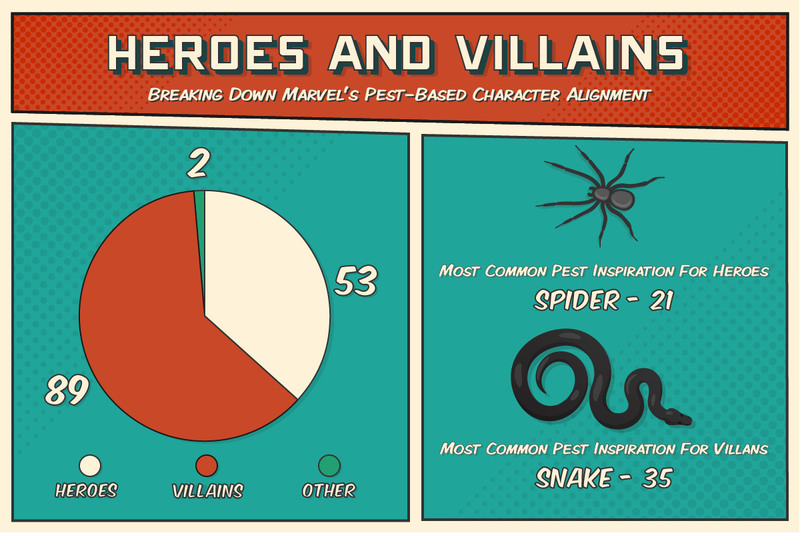 Probably not too surprising is that not all of the characters who are pest-based are heroes. In fact, most of them are not. 89 are primarily villains, 53 are heroes, and 2 do not fall into either category. For the villains, 35 of them draw their inspiration from a snake. For the heroes, 21 are based on spiders, likely due to the popularity of Spider-Man. However, it is interesting that such a commonly-feared pest (the spider) is often represented as a hero. Going along with the fact that snake-inspired characters are popular, once of the study’s research areas was the group affiliation of these pest-based characters. Serpent Society comes in as the group with the most representation — 19 characters in all. Interesting, the X-Men only have three. 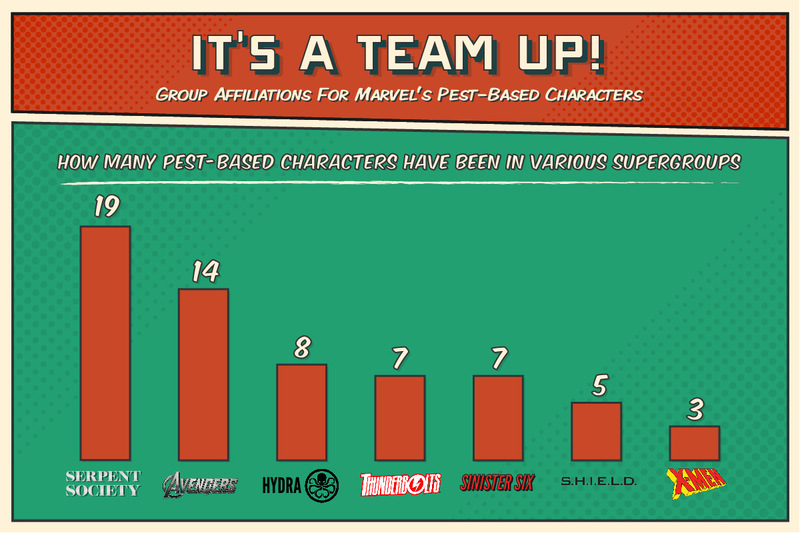 The Avengers, however, have 14 pest-based characters in their ranks. Speaking of The Avengers, it would be impossible to write an article on bug superheroes without mentioning Ant-Man. The Ant-Man movies have done well at the box office but he’s certainly not the only one. According to the Insight Pest analysis, there are 11 pest-based characters who have made appearances in movies or television shows. One of the wonderful things about comic books is that there is something for everyone. There are so many books and so many characters that you would be hard pressed to not be able to find one that appeals to you. For many people, that appeal is the characters and specifically characters that are based off of nature or animals. In Marvel, this is certainly a common trend and this analysis breaks down all the stats you need to know about all of them.